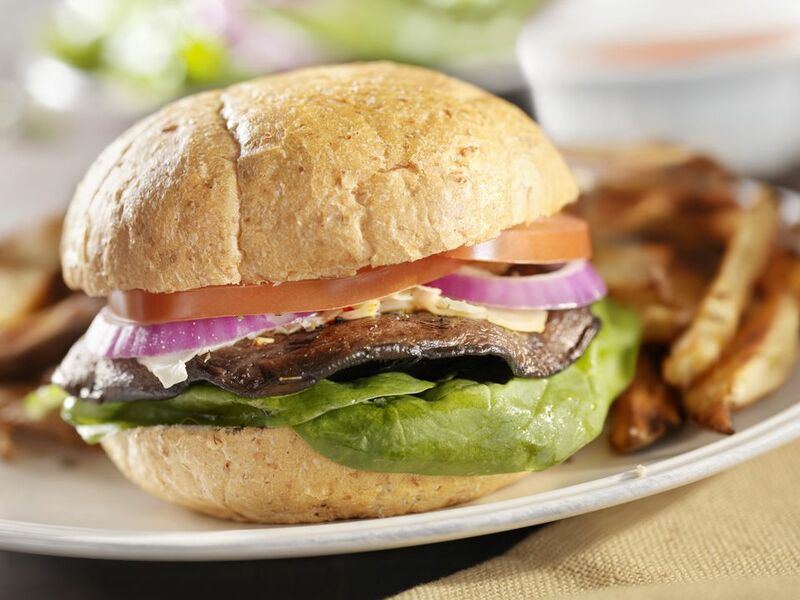 Portabello mushrooms make for a healthy veggie burger option for a vegetarian barbecue or vegan cookout. This recipe tops pan-fried or grilled portobello mushrooms with a perfectly cool (but quick to whip up) avocado and yogurt sauce. For a vegan and non-dairy portobello mushroom burger, omit the yogurt sauce or make it with non-dairy soy or coconut milk yogurt. Avocados from Mexico provided this recipe, which is perfect for a hot summer evening. You can include your favorite condiments or additions such as lettuce, fresh spinach leaves, or sliced tomatoes. Stack it up or keep it simple. Lightly brush the individual mushrooms and onion slices with a bit of olive oil on both sides. Sprinkle the mushroom and onion slices with 1/2 teaspoon of the salt and 1/4 teaspoon of the pepper; reserve the remaining salt and pepper. Heat large a skillet or grill pan over medium heat until hot. Add the lightly-oiled portobello mushrooms and allow them to cook until fully tender, 8 to 10 minutes, turning once. Once the portobello mushrooms are fully cooked, transfer them to a plate, cavity-side up, and cover the mushrooms lightly with a paper towel or a kitchen cloth to keep them warm. In the same skillet or grill pan, cook the onion slices until lightly golden brown on both sides, about 8 minutes, turning occasionally. While the onions are cooking, start to prepare the avocado and yogurt sauce. In a small bowl, combine half of the avocado, yogurt, minced garlic, and the remaining 1/4 teaspoon of salt and black pepper. Using a fork, mash everything together until smooth and creamy. To serve and assemble your portobello burgers, spoon the onions and the optional roasted red peppers into the grilled mushroom cavities, divided equally. Spread the smooth avocado mixture on the bottom of each bun and then top each with the stuffed mushrooms. Top each burger with the remaining sliced avocado and any additional veggie burger fixings you'd like. Cover with the tops of buns and serve. If you have any leftovers, refrigerate them and use them within three days. You can also grill the mushrooms ahead of time, refrigerate them, and heat them up for serving later. To reheat, either microwave them for 1 minuter, grill them briefly, or cook in a frying pan with a bit of oil.